Happy LGBTuesday, readers! This Tuesday we’ll be talking about one of the queerest TV series currently airing on cable, Steven Universe. This wonderful cartoon series helped push the trend of queer representation in children’s media. The show is about a boy who is half Gem, a mystical alien race, and half human. It follows him growing up in the care of three women who form a group called the Crystal Gems and try to teach him about his mystical powers and their culture. Overtime the plot becomes more intricate as Steven learns more about his culture, including the revelation that his guardians are all traitors to their home planet and fought a war against their own people. The story offers more than this rebellion plot though as much of the series is about how the Crystal Gems became fascinated by humanity and life on Earth due to its unique abilities to change and grow, concepts which were unheard of in Gem society. Much of the show focuses on the life they have made there and the connections they have shared. The queer themes in Steven Universe can be seen early on in the series, particularly in the concept of fusion. This ability that Gems possess lets two or more of them join together to form a new person and is heavily symbolic as a metaphor for relationships. Steven is the only male Gem in existence so anytime other characters fuse the fusion and relationship is always focused on two or more women. All the queer themes aren’t symbolic though. There have been at least two clear relationships in the show which are shown to be more than just a strong bond between the characters. The first is the relationship between Ruby and Sapphire two gems who are almost constantly fused into one of the main characters, the leader of the Crystal Gems, Garnet. The other relationship shown is between Pearl and Rose Quartz, the previous leader of the Crystal Gems and Steven’s mother. This relationship is developed through a number of flashbacks and reminiscence that Pearl shares as Rose has passed away, because she had to give up her physical form in order for Steven to be born. Steven Universe is a story with many focuses including family, growing up, coming of age, the blend of fantasy and reality, and of course its queer themes. At times viewers may become frustrated when the story switches from a serious story arc back to laid back moments in Steven’s life, but for others this is part of the charm of the show. No matter how serious the stakes get you still get to go back and see what kind of life it is that Steven and the Gems are fighting for. 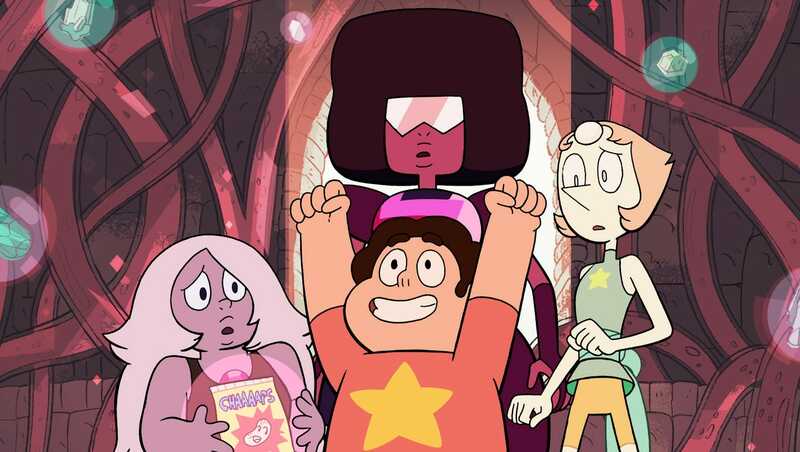 Steven Universe airs on Cartoon Network and is currently on its fifth season. The Library has the entire first season on DVD in our New Animedia collection. Unfortunately the first season is the only one that has been released in a physical format, but the first four seasons are available for viewing to Hulu subscribers. You can place the first season on hold in our catalog here.